Miller High Life is the oldest beer in the Miller Brewing Company lineup by far, having been around since 1903. Known as "the champagne of bottled beer," it was originally sold in tiny champagne bottles and occupied space in the fledgling premium American beer market. Over time though, the market evolved and High Life became a near-forgotten budget brand, taking a back seat to Miller's flagships MGD and Miller Lite. 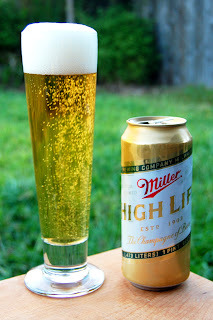 During the past few years though, High Life has made a bit of a comeback. It's now positioned as an earnest, no-nonsense throw-back low-cost beer, thanks to plenty of clever marketing. Let's pop the cork on this everyman's champagne and take a taste of the high life, shall we? Appearance: A crystal-clear straw body capped by two fingers of bubbly white head that feature surprisingly good retention and decent patchy lacing. Aroma: Husky and grainy pale malt with lemony hops. It’s thin and very clean, but not offensive. Taste: Just as promised, the flavor profile is composed of grainy and husky malt with a twist of lemony hops. It’s pretty bland in general, but not bad for the style. The aftertaste is clean, with just a hint of husk and grassy hops remaining. Mouthfeel: Medium-light bodied with crisp medium-high carbonation and a hint of dryness in the finish. Drinkability: As always with this style, drinkability is the aim, and they’ve hit their mark here. Sure, it’s a little plain, but it gets the job done. Verdict: Miller High Life is one of the best examples of this perpetually weak style out there (please excuse the backhanded compliment). If I had to pick one American Adjunct Lager out of a cooler at a party, I think this would be it.